Growth in the Spirit conveys personal and spiritual growth. Green leaves grow and sprout upward representing springtime, the beginning of life and growth. Three colours — red, yellow, and blue — make up the body of the flower. Red symbolizes the passions, which we all have. The second stage is the colour yellow, representing light and enlightenment. This is a phase of learning and growing. Blue, the third stage, symbolizes inner peace, serenity, and virtuous living. 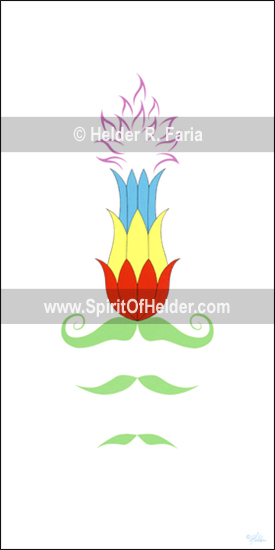 The blooming and exploding face of the flower, consisting of twelve flames, is the final stage. Its purple colour represents spirituality (spiritual growth), royalty (entrance into Heaven), and victory (eternal salvation and happiness). The twelve flames are also symbolic of Pentecost. Tongues as of fire appeared to the twelve apostles, rested on each of them, and they were all filled with the Holy Spirit. In addition, the twelve flames represent the twelve fruits of the Holy Spirit: charity, joy, peace, patience, kindness, goodness, generosity, gentleness, faithfulness, modesty, self-control, chastity. When one has a deep relationship with God and is filled with the Holy Spirit, he/she explodes with all kinds of growth and wisdom, much like a blooming flower. That person is thereby able to bear much fruit. Thus, the flower most aptly symbolizes Mother Mary, who is the greatest Christian example of holiness. She is known as the daughter of God the Father, the spouse of the Holy Spirit, and the mother of Jesus Christ. Mary is also the mother of the Church. Finally, the three persons of the Holy Trinity — the Father, the Son, and the Holy Spirit — are represented in the use of the three primary colours. Blue is the colour of our heavenly Father, the colour of peace. Red of Jesus Christ, the colour of sacrifice. And yellow of the Holy Spirit, the colour of light.